Always good to see a new English sparkling wine that’s of top quality. I was really impressed by this. 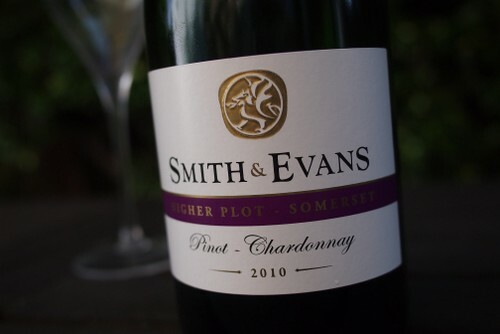 It’s the first crop from a vineyard in Somerset, planted in 2008 by Guy and Laura (the Smith & Evans behind the wine) and you can find out more about it on the Smith & Evans website. This was disgorged in March. 2 years from planting to production in a cool climate. Boy, that is pushing a friendship. The only way you could possibly comment on this would be to try one and I’m guessing that this isn’t the case? It’s three full growing seasons on a reasonably vigorous site and the wine is what it is. We have put it in front of a Michelin 3 star sommelier, top end independent retailers as well as the winemaking team at one of the major Champagne houses and comments more or less accord with those on this site. As for any relationship that I may or may not have with Jamie then I’m sorry to disappoint you. I do know him as we did a bit of work together seven years ago on a project but I’m afraid I really don’t know him remotely well enough for him to remotely compromise himself over our wine. Don’t understand the “two years” comment; it’s a 2010 wine and we’re in 2014, have I missed something?! And isn’t there a law that says you’re not legally allowed to release wine from vines under 4 years old in the EU anyway? Certain regions do have laws that say vines under a certain age can’t be used but nothing in EU law. We are lucky to have viticulturalist Richard Smart living close by and he believes that if a vine produces grapes from year one you should let them as this is what would happen in the wild. I am not sure if anybody has ever studied the positive or negative effects of early cropping but we didn’t risk it and only took a small crop in 2010 three seasons after planting. That’s interesting re Richard Smart; have heard him say that you’ll get just as good grape from a young vine (first few years) as you will the much heralded ‘old vines’. The reason being in both cases it’s the canopy that’s less dense so allowing more sunlight through to the grapes. Not sure marketing it as ‘very young vines’ has the same cache though! Guy smith your doing a great job take no notice of your amateur critics! Thanks Vicky! I suppose you sort of have to let your wines loose on the world and let them speak for themselves.